Always, Katie: A New RE and a New Plan! We met my new RE last week, and left the office feeling encouraged and optimistic, and awed at God’s obvious involvement in this match up. Such a wonderful feeling for a couple who has spent the last year and a half or so wandering in the desert - so to speak - and waiting for a comforting sign that He was still paying attention! I am seeing Dr. G. now, who is a partner in the practice I used before we moved to SC (the doctor I saw there moved just before we did), and happens to be down the hall from my ob/gyn. When we sat down in his office, Ethan saw a Calvin and Hobbes anthology on his desk and took that as a sign of a kindred spirit :-) And he was pretty much dead-on! He seems very fascinated by my case, which is really encouraging. Hopefully if he’s fascinated, he will be aggressive and creative in treating me! He does want to see my hemaglobin a1c down to 7 (and I honestly have no clue what it is right now. With all the moving and stuff, endo appointments have kind of gotten lost in the shuffle). To that end, he referred me to a new endo here, Dr. K., who will hopefully not yell at me the way my old OH endo did! Yelling is so not helpful! 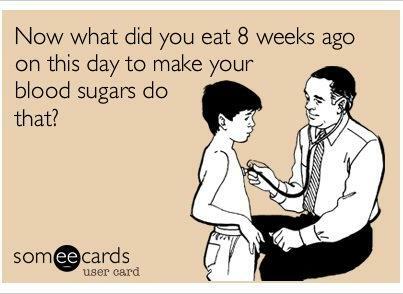 via Type 1 Diabetes Memes Which is hilarious, by the way. You should visit them. Dr. G. is also addressing my ridiculously high DHEA-s level, which is probably responsible for my fatigue and hair loss. I have orders for a CT scan of my adrenal glands, because he thinks I may have a nodule on one of them, and for some blood work – to check some diabetes-related levels and my AMH and prolactin levels. We’re going to try to get that scheduled on the same day as my first appointment with Dr. K. May as well kill a whole bunch of birds with one of Ethan’s leave days! The thing that just shocked and delighted us about this appointment though, was when I mentioned the name of my RE in SC, and Dr. G. said, “OH! How IS [firstname]!?! He was my research mentor! I just love him!” Leaving Dr. L. down there was easily the hardest thing for me about leaving SC, so to find out that we are being cared for by someone who was trained by him, who is a big fan of his and who reminds us so much of him in his academic curiosity and personality… just feels miraculous, and helps us feel that we are in the right practice! And for a last little bit of humor - I made these to wear to all of my RE appointments :-) The nurses and receptionist were tickled pink... good ice breaker!! 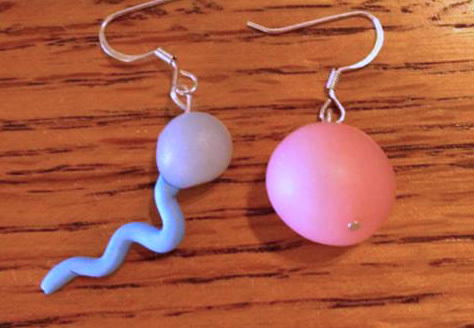 I also have a clay embryo necklace to wear closer to transfer time, haha! Loved reading this!! Prayers continuing with y'all!! Glad to see you still have the never give up attitude you did in high school. You are ana amazing person, and God will bless you soon enough. You are one person that truly deserves it. I love the earrings! So glad you found a great RE. Where in Ohio did you move to? I am from Toledo! those earrings are really funny. glad you found a great RE and dr you like. it makes such a difference to be seeing someone who like and trust.